This title is no longer available for rental. Hardly known in Australia and not known Internationally, this mouthing system is quite frankly the secret to my success. 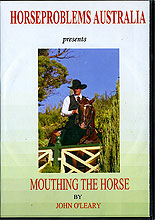 It is THE ONLY mouthing system on the Planet that can re-educate the mouth of a diminished horse. This system will give the amateur the tools to do what most Professionals can't do and offers most Professionals a 'career changing opportunity'. As always, produced with the Novice in mind and explained in a step by step manner so that they can completely understand, without the 'buzz words' and hype that is common place these days. Novices may mouth their own horses, better than most horse breakers!!!! John comes from a long list of exceptional Horseman who have had a major impact on the horse world in Southern Australia. Johnâ€™s father had 8 brothers and 2 sisters. The 8 brothers all went on to be horse breakers. They then all became racehorse trainers and all trained winners. John Oâ€™Leary founded "Holidays on Horseback" in South Australia, and escorted some 57,000 riders on these over a 15-year period. He also founded High Country Trails, which is still operating at Normanville and has been since 1975. He has had around 15,000 horses through his hands as a trainer and re-educator and has been a career horseman for 35 years. His wife Linda is an Equestrian Federation Coach and has herself ridden over 6,000 individual horses. John ranks her as by far the best educator of the young horse in South Australia, possibly in Australia. She is an NCAS. E.F.A. Level One Coach and awaiting her Level 2 exam. In 1996, John and Linda purchased the Gainsborough Equestrian Centre which they now own and operate.